Meridian celebrates 25 years of digital speakers with Special Edition models | What Hi-Fi? British audio specialist Meridian is celebrating the 25th anniversary of the launch of its first digital speaker, and to mark the occasion it has unveiled a Special Edition series of DSP digital active models at CES 2014 in Las Vegas. It was back in 1989 that Meridian introduced the world's first digital speaker in the shape of the legendary D600. Now it has developed a trio of SE models which feature a beryllium domed tweeter, new electronics and driver clamp rings to deliver the "highest-performing Meridian DSP speaker yet". 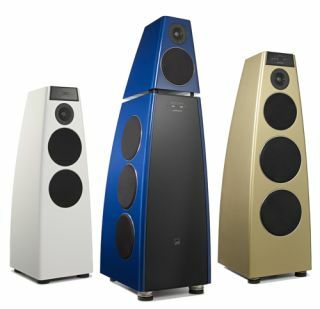 There are three Special Edition models available, the DSP8000, DSP7200 and DSP5200, all of which (shown above) are on display in the Meridian room here at CES. Standard finishes are gloss black and white, but bespoke colours are also available. Production is due to begin in February, but UK prices are still to be confirmed. Also spotted in the Meridian room were the new G55 and G57 power amplifiers. The company has decided to re-introduce two- and five-channel amps to its range of electronics to enable surround controllers such as the new G65 (also on show) to drive passive speakers from other brands. The stereo G57 power amp costs £4000, the G55 five-channel amp £4000. Meridian says the new G65 controller is designed to operate with the HD621 HDMI processor, which separates out high-definition audio and video to improve the quality of both.